If you are planning an outdoor wedding, a wedding tent is essential. If you want to do something unique for your wedding to make it a very special day to remember, then choosing wedding rentals is a perfect way to make your wedding event as special. Tent rentals offer you several kinds of wedding tents that allow you to have an excellent outdoor wedding, which don’t have problems of the weather and they would allow you to celebrate your wedding party in any situation. Theoretically outdoor weddings are ideal to create a special movement and romance. There are several decorative tips that works together to make your wedding as a memorable event. Lighting, flowers and accessories are all important elements while decorating the wedding tent. • To create a magical sense, first choose the right tent theme and style. 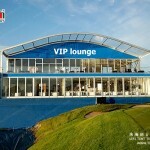 Sheer or light weight tents are pretty, and they can also give cooling effect even in hot weather. 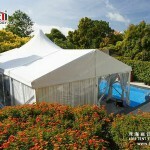 • If you are planning to make your wedding at night, choosing clear top tent will be truly magical. • You can use projectors to cast patterns or images onto the tent’s ceiling or sides. • Plants and potted trees add warmth to the wedding tent. Wedding rentals will provide you several types of decorative trees and plants. • Adding lighting to a tent is very important. This would draw attention of guests away from any “ugly areas”. • Dress the ceiling with tulle swags that matches with your wedding colors. You can also hang the swags of white twinkle lights above the tulle. The fabric can be luminescent. • Hang chandeliers and paper lanterns from the ceiling of the tent. • Use classic statuary and urns to decorate your wedding tent. • Wrap vines that may be faux or real around the poles of the tent. • When decorating the interior of the wedding tent you need to create a harmony and balance. You have to take the layout of the room and placement of the windows into consideration while making your decorative efforts. • Hang strands of beads or crystals of varying lengths inside the tent ceiling by using florist pins and fishing wire. Use aurora or clear borealis crystals, or you can also mix and match with different shades of the bride’s wedding colors. 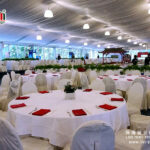 How to Decorate Wedding Marquees For Special Day? 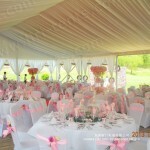 What Wedding Marquee Is Your Best Choice?